The Victorian Coalition Government declared yesterday, Tuesday 25 Feb 2014, ‘Super Tuesday’ after Planning Minister Matthew Guy fast-tracked five residential projects for approval – the largest number of private residential permits made on one day by the state government. Guy says that the ‘Super Tuesday’ permits will drive new jobs and investment into Melbourne. Over 2,000 new apartments, $557 million in new construction work and up to 4,000 new construction jobs are expected to result from the announcement. The five developments will be new high-density housing in the central city areas, and include 127-141 A’Beckett Street, which will have 63 storeys and 632 apartments, and is worth $164 million. 464 Collins Street is worth $100 million, and will go up to 55 storeys, as will 398 Elizabeth Street, which is 178m high and comprise 466 apartments. 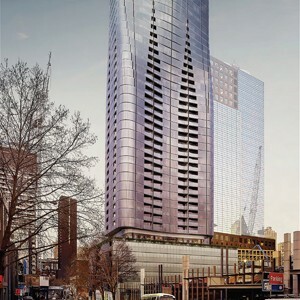 $70m 420 Spencer Street will consist of 438 apartments across 38 storeys, while the 18 storey, 61 metre 395 Docklands Drive will have 360 apartments. “With the release of these five towers in Melbourne, new home buyers and others can once again have confidence that the state government is aggressively tackling the housing affordability issue in outer as well as inner city markets,” Guy said. However, The Age reports that RMIT planning expert Michael Buxton believes the towers that were approved are not what middle-income Melburnians wanted. Instead, young to middle-aged people are more interested in purchasing medium-sized properties in the CBD. “They’re pulling down Melbourne to satisfy a few rich developers and overseas developers. Matthew Guy is not going to stop until Melbourne is destroyed,” said Buxton. But Guy has rebutted criticism that small blocks could turn Melbourne into a “Hong Kong-style city”. “Melburnians have made it clear that they want their suburbs protected from high-rise apartment development. To achieve this we’re delivering density in defined locations like Melbourne’s CBD and the Docklands – not in our quiet suburban streets,” he said. The ‘Super Tuesday’ approvals reflect the new Plan Melbourne policy in action with the delivery of an expanded CBD.